Its Day Six of OSR Christmas. Before we get to today's festivities, let's find out who is the recipient of yesterday's awesome gift. I would do a drum roll but that doesn't work so well on a blog post. Oh well. Keith Sloan - congrats. Email me at tenkarsDOTtavern and we'll get you hooked up. Lo, the enchanted forest wherein lives the goblins and faeries beckons… will you heed the call? Now you can, with Purple Duck Games’ Campaign Elements 8: Goblins of the Faerie Wood for Dungeon Crawl Classics! Whether “questing for it”, seeking enigmatic items like the weird of Sorthal, or just stumbling into a thin wall between The Lands We Know and the World of Faerie, entering the Faerie Wood of the Goblins will be a memorable experience. Your DCC players can meet King Ifhane of the Red Hoods, roam the Goblin Field and sample its wares, ask dangerous questions of the Gray Ones, or seek the advice of the Ogre Sorcerer… al at their peril! 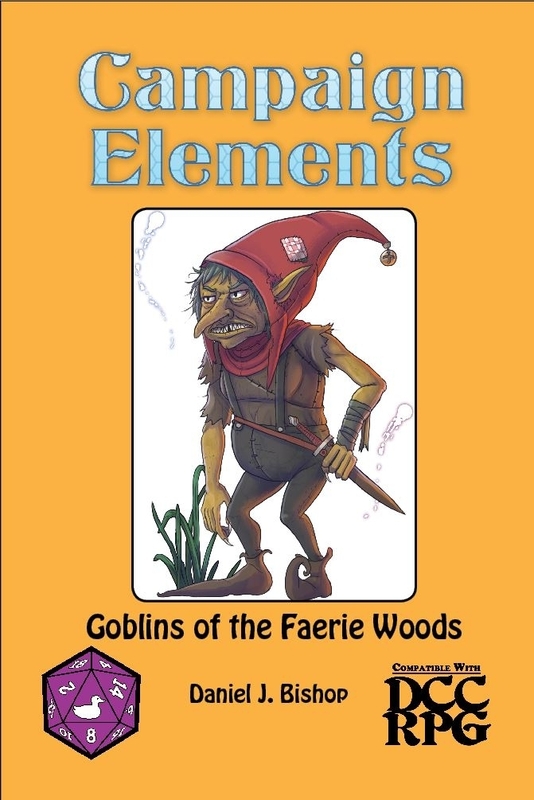 CE 8: Goblins of the Faerie Wood is suitable for a 0-level funnel for goblin characters- using an exciting appendix for creating goblin adventurers who can be stealthy warriors or tricksome witch doctors, adding a new exciting option for your DCC gaming. With six detailed encounter areas, lots of interesting twists and turns, get your copy of CE 8: Goblins of the Faerie Wood from the goblinoid good-guys at Purple Duck Games- where our games are what you want! Nice! Congrats to Keith too! Nice. I love Daniel's DCC adventures. I particularly like that one. Daniel's stuff is great. I certainly don't have enough of it. Interesting. I've never considered DCC all that much, but my interest is increasing. This adventure intrigues me. I may end up picking this up even if I don't win. Congratulations to all of the prior winners! Thanks, Erik, for running an awesome holiday campaign. Love DCC, so I'm in!!! Always up for some DCC goodness! ooh, this looks good as well! Trying again. Merry OSRmas everyone! I've been wanting this one. Thanks for the reminder. I'm just here for the Daniel Bishop loot. Congrats to Keith! I'm ready for some Daniel Bishop adventure time! Oooooh DCC ! Want ! We're all very excited about the start of our DCC game. We have played it many times but only as one offs. Congrats! Jealous! A sacrificial victim with an unethical disposition must be tied or chained to a stone altar. They will die upon casting the spell. Your mom loves faerie wood. Heck yeah, DCC is my drug of choice! Please, please, please! I've been good! Looks like I was too late for yesterday. In for this one though! Thank you and Merry Christmas! Hurray! Fae goblins! The best kind.